Life habit: lichenicolous Thallus: little or none; prothallus: absent; without asexual propagules Apothecia: adnate, 0.3-1 mm in diam., lecanorine disc: brownish orange, flat or slightly convex, epruinose margin: persistent, flush; thalline margin absent; proper margin visible, concolorous with disc parathecium: elongate to oval cells; exciple below hypothecium amorphous epihymenium: golden, K+ red, C- hymenium: hyaline, 60-75 µm tall paraphyses: 1-2 tip cells slightly swollen, frequently branched; subhymenium hyaline asci: cylindrical, 8-spored ascospores: hyaline, 2 locules, ellipsoid, (10-)11-12.5(-14) x 5.5-7 µm, isthmus 1.5-3 µm, spore end wall thin Pycnidia: not observed Secondary metabolites: parietin, fallacinal, emodin, and teloschistin. 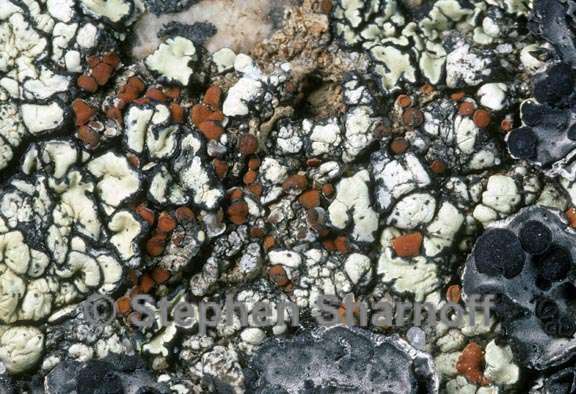 Substrate and ecology: on lichens over non-calcareous rocks World distribution: Europe and North America Sonoran distribution: Arizona, southern California, and Baja California. Notes: Caloplaca epithallina occurs on various other lichens on non-calcareous rocks. The apothecial discs are dark red-orange and the margins are the same color as the discs in contrast to C. grimmiae that has brown margins.